The main interface consists of a Toolbar, a Sidebar a View and the Status Bar. The Toolbar allows you to toggle the current view mode, for instance to swap between Photos and Dives, or between a list of sites or a map. It contains a Quick Action menu, a shortcut for the Inspector, and a search box to filter the current view. 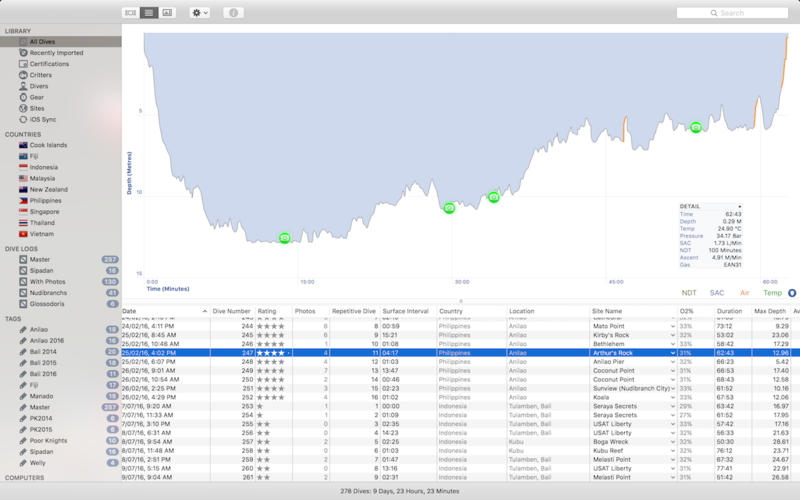 The Sidebar allows you to navigate around the various parts of MacDive, or to filter your dives in various ways. Each of the sections such as Gear, Sites, etc are described in more detail. You can view documentation for them by choosing them from the help menu. The main view displays content for the section you are looking at. When you start MacDive you'll generally be viewing All Dives, a list of all your dives. The view will change as you navigate around the application, for instance to show your Gear. The status bar at the bottom of the application shows you some basic statistics about your dives, your gear, your sites etc. This is generally based on the View you are currently using. In some cases, such as when you are Downloading Dives, it may instead show you some information about the current progress.